The Sanctuary of the State College Presbyterian Church was completed in 1913 with the first service held on September 7, 1913. The final report of the Building Committee showed that the furnished building costing $57,030 and the land cost $7,750 (two lots) for a total investment of $64,780. The original Haskell pipe organ was given by Mrs. Charles P. Turner of Philadelphia in memory of her husband, and the tower bell that called the people to worship by Mr. Alba B. Johnson, also of Philadelphia. The beautiful stained glass window at the front of the sanctuary was given by John Hamilton and his wife, Elizabeth. Dedication services were held October 5 thru October 12, 1913. Thus, this gothic "Church Beside the Tower" built of native limestone, stately and inspiring, began its mission. It had many new opportunities, many responsibilities, and its members needed courage and pioneer spirit to look to the future. The Haskell organ was rebuilt in 1923 and the console was moved from the choir loft to the main floor. Organ chimes and electronic tower chimes were installed in 1939 and 1940. In 1966 a new Moller organ would be installed and named the J. Max Krumrine Pipe Organ in honor of Max's 42 years of service (1926-1968) as Church Organist. 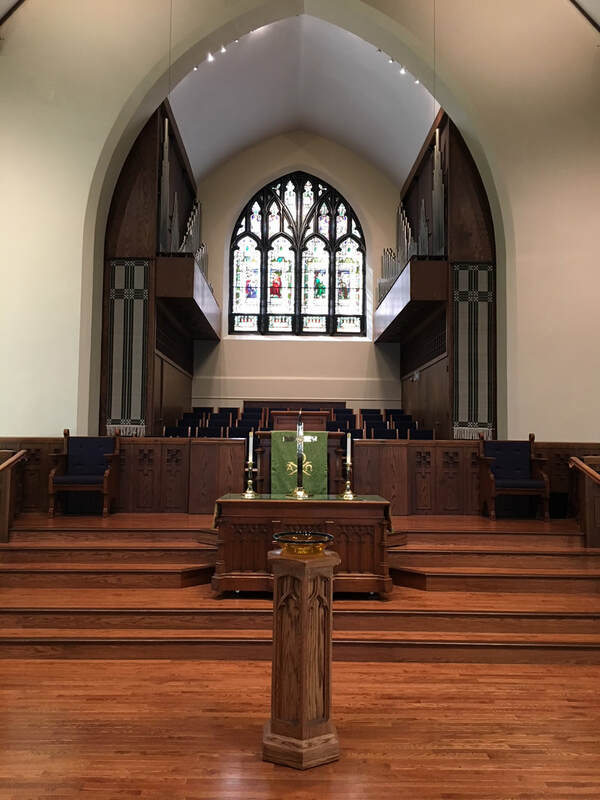 The choir loft and chancel area of the sanctuary were remodeled to accommodate a larger choir (about 38). Pews were eventually added to the balcony to replace outdated wooden chairs, and insulation was installed on the sanctuary ceiling. New carpeting was installed in the summer of 1981 and new pew cushions were added in 1989. In 1994, when the new Christian Education wing was added, additional sanctuary appearance and lighting improvements were completed. A new sound system (including hearing assist devices) was added in 1998-99 to enhance the worship experience for everyone. The maximum seating capacity of the sanctuary is approximately 600. Small window top left -- Word of God: John 3:14 "Just as Moses lifted up the snake in the desert, so the Son of Man (Word of God) must be lifted up"
Small window top right -- Serpent on a Pole: Numbers 21:4-9 "The Lord said to Moses, 'Make a snake and put it up on a pole; anyone bitten can look at it and live.' So Moses made a bronze snake and put it up on a pole. Then anyone bitten who looked at the snake, lived." Each left-hand side window Scripture complements the matching right-hand side window Scripture, showing the connection between the Old Testament passage and the New Testament passage. In windows 1, 2, 3 & 4: "These all, having obtained a good report through faith, received not the promise: God having provided some better thing for us."